Watch our sessions live on twitch.tv/gorbash722 every Sunday night beginning at 9:30pm Central. Catch up on previous sessions on YouTube. 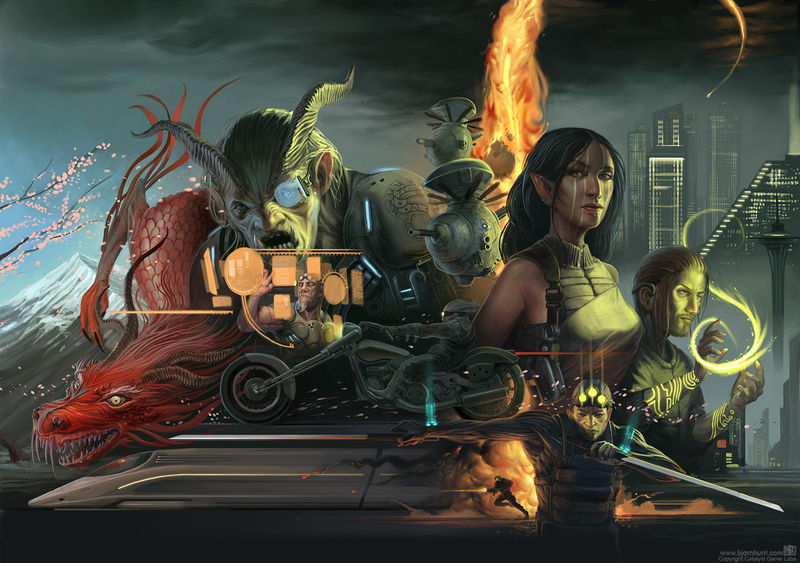 And so we come to the end – not only of our latest Shadowrun mission, but also our campaign, and Shadowrun Fifth Edition. The official published adventure “Splintered State” acted as our grand finale, after some modifications. From here we’ll be moving on to Dungeons & Dragons Fifth Edition for a change of pace. This was probably one of our more interesting recap episodes, since this was the first pre-published adventure for Shadowrun I’d ever used. Our previous three adventures were all originally written and crafted by me, for better or worse, and I wanted to try using an official adventure at least once. Some time during our previous adventure I decided that I’d had enough with Shadowrun’s obtuse rules and complex systems, and wanted to draw our campaign to a close. 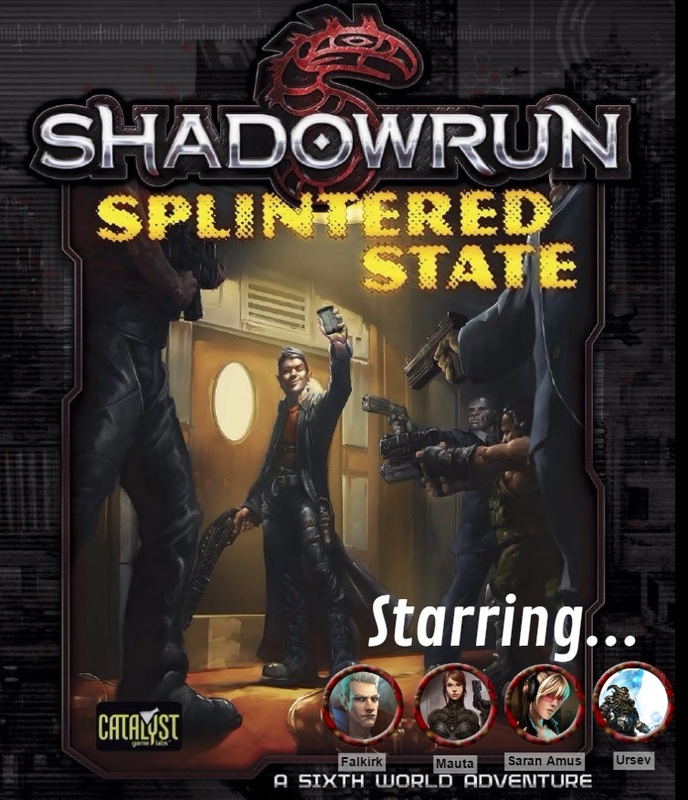 Though “Splinterd State” would only be our fourth mission, we’d have been running our campaign for six months. Given my players’ recent run-in with Knight Errant law enforcement in the form of a refused quest-giver, I decided that “Splintered State’s” introduction via arresting all the players would work perfectly. I tweaked a bit of plot and switched out several NPCs to make them work for our campaign. My players got a kick out of seeing these returning NPCs. The various characters I created along the way were defeinitely the highlight of the campaign – from Jeremiah Redd the cockney-accent ork gang leader to a rival street-runner gang that had escaped them before, I had a lot of fun bringing in old friends and foes back into the mix [Session 1]. Unfortunately the plot of the adventure is needlessly steeped in backstory and information, when it simply comes down to having a McGuffin that other factions want, and will kill for. 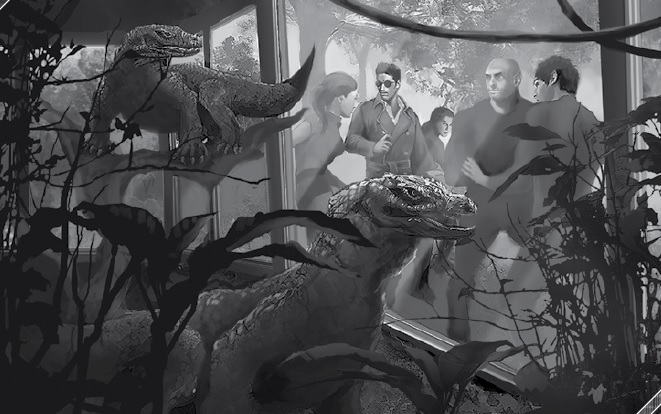 I’ve learned that my players are not fans of not knowing what to do next, but I feel this adventure did a good job presenting the options clearly and laying out their next steps, such as Dietrich calling them directly to buy the commlink at the zoo [Session 2]. The zoo (Session 3) went over really well. I was impressed how the PCs handled scouting it out, smuggling in guns and generally being very prepared. Too bad they got ambushed anyway! It felt very ‘Gotcha!’ since there was nothing they could have done when the elite Chimera assassins showed up. Thankfully the assassins leave quickly before murdering the players, but it was a nicely tense situation. Dietrich suffering from multiple personalities was also a fun roleplaying opportunity for my players to deal with. For some reason every adventure has one player that takes the majority of the damage. 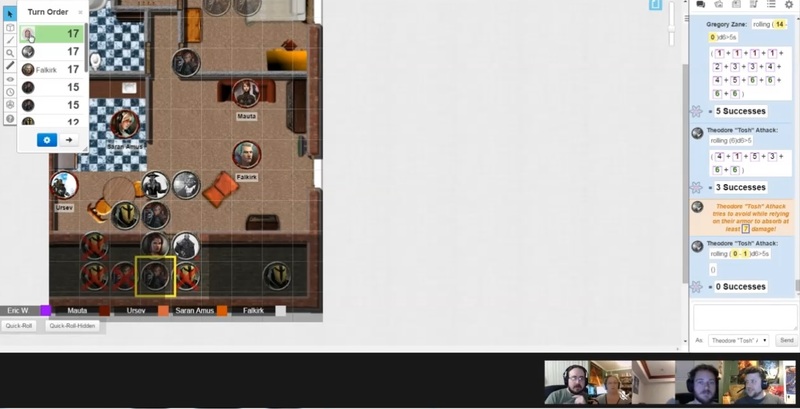 Previously it’s usually Ursev but this time Falkirk took heavy amounts of stun damage, and actually dropped unconscious during the final battle back at the safehouse – from an ally NPC’s errant grenade [Session 4]! Before the final battle the PCs had the choice of who to sell the commlink to – opting to only even talk to the ‘good’ choice, the underground resistance trying to undermine the evil racist Governor Brackhaven. The published adventure has lots of different options and outcomes available, which meant as a GM I had to build a TON of NPCs and we ended up using less than half of them. Wouldn’t have been so bad if I could’ve used them in future missions but as I mentioned above – this was our final Shadowrun adventure. Everyone was generally very positive and pleased with this adventure. They loved seeing old NPCs crop up and have meaningful roles, and they enjoyed having a clear objective halfway through (meet Dietrich at the zoo) but different options on how to approach it. They weren’t terribly keen on using their contacts during the initial commlink investigations. We hadn’t used the contact system very well in previous adventures, and it’s another obtuse and somewhat strange system in Shadowrun. I love Shadowrun’s setting. When we first started talking about doing online role-playing again early this year, I immediately jumped at the chance to do Shadowrun. The sci-fi cyberpunk setting with fantasy races and magic is just so damn fun and interesting. Too bad the rules are kind of awful! After six months I don’t have much of a better handle on many of the systems, and we purposefully cut out many of the more complicated things like recoil and most matrix stuff. The fifth edition rulebook is also a bloody mess that’s terribly organized. After six months I’m ready to move on to a different rule system and setting. I miss monsters, I miss loot, I miss dungeons. I think my players will really excel at the D&D gameplay and story flow more-so than Shadowrun’s. I’m really glad we tried Shadowrun and I’ve learned a lot as a GM, and look forward to continuing our online role-playing adventures with a fresh ruleset and setting. I’ll definitely keep the Shadowrun mantra of Shooting Straight, Conserving Ammo, and Never Dealing with a Dragon.